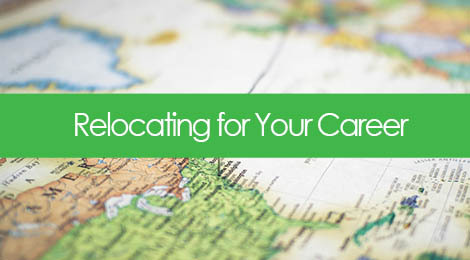 Changing jobs and moving up in one’s career can often go hand-in-hand with the consideration of relocation. Particularly if you’re in a specialized field where the job opportunities are narrow, geographic location might be the driving strategy behind your search. For others, it’s about expanding or exploring opportunities, perhaps on a personal level, and looking at a different job market to achieve those goals. Of course, relocating for work, when it’s your choice and not prompted by an existing opportunity, poses the challenge of getting in the door as an out of state candidate. First, there’s the challenge of competing against local candidates who might be able to transition more quickly into the role without having to pack up and settle somewhere else. And then of course, there is the issue of relocation assistance, which, for most positions under the extremely senior, or even executive levels, companies typically won’t offer. There are hurdles involved when it comes to relocating; the upside of that, however, is that if you are aware of what they are, you can speak to, and avoid them much more easily when it comes to marketing yourself as a candidate. 1) They are considering a move based on circumstances that would provide an upward move in their career paths. As such, they’re targeting a very particular type of work, at a particular level, the availability of which is often dictated by the geographic market. For instance, someone targeting a high-level position within biomedical engineering might be considering Boston, where the industry is thriving and there are a number of highly renowned research universities like MIT. These are typically the roles for which companies are apt to openly consider out of state applicants and perhaps even offer relocation assistance, since they know quite well that they are targeting a very specific type of candidate that may not be found in their local market alone. Or perhaps they are located in a growing marketplace that hasn’t quite taken hold. As such, they have to open up their search and make it more accessible to candidates outside their geographic area. 2) They are focused on one, or maybe several geographic markets to which they want to move, perhaps for personal reasons, and are looking for a cross fit between location and career potential. Case in point, those seeking a high quality of life at a lower cost of living might not fare well in expensive and dense cities like San Francisco and New York. This second category is where most people fall, and it can be much more challenging to convince hiring managers to give you a fair shot, since you’re actively seeking them out, and not vice versa. The key to succeeding in either situation is to convince prospective employers that, were they to hire you, it would be a smooth and fast transition. The likelihood is that the company needs to get someone into the role and up to speed fairly quickly. This is certainly grounds for favoring more local candidates. But if you can alleviate their concerns around hiring someone who doesn’t live in the neighborhood, you might just have a decent shot. So how do you send a laser-clear message to make this point? Don’t try to cover up the fact that you’re out of state – the sneakiness will likely deter them once this information becomes known during the interview process. Instead, speak directly to it in the cover letter, providing a definitive timeline around you availability to alleviate any uncertainties. Let them know that you are “currently in the process of relocating to Chicago”, along with your availability to both interview and start. General rule of thumb – they generally want to see an available start date of within 3-4 weeks, unless it’s an executive level position, or you’re outside of the country. Having a physical local address that you can slap onto the resume is ideal (I used to use my brother’s when I moved to Brooklyn from Boston). But it that’s not a possibility, leave off the full address and instead just denote the cities you are targeting in the contact info line, such as “New York | Philadelphia | Boston”, or simply “Charlotte, NC”. A different approach to the situation would be to suggest doing what’s called a “working interview”. This is a type of interview in which you are essentially doing the duties of the job (generally for free, occasionally for pay) so as to give the potential employer a taste of potential. Not all employers will have the time and resources to embrace the idea, and it may be determined by your availability to work onsite or offsite for a short period of time. But what better way to give them insight into the value you can provide for them in the role, than by actually doing the job itself? This is something you can suggest in the cover letter, or during an initial interview. Even if they don’t go for it, it shows a high level of interest and initiative on your part. Job searching is tough enough when you’re targeting opportunities in your local market, and relocating folks face the added challenge of understanding and competing in a new market. But you can position yourself for success by doing the right research, preparing your story, showing flexibility and initiative, and communicating your ability to meet the immediate needs of the organization and the role. Tags: career, career change, cover letters, relocation, resumes, shameless self promotion, transition. Bookmark the permalink.